I am very happy to have the ability to provide my expertise for the underserved community in Ecuador. Cleft issues can often leave families in disarray in those communities and being able to give back to those communities is an important part of being a physician and doctor. Dr. Babak Azizzadeh will participate in a medical residency designed to provide comprehensive cleft care for patients born with cleft lip and palate in underserved communities. 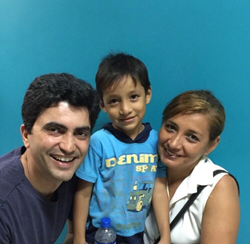 Together with The Global Smile Foundation, Dr. Azizzadeh, and several other volunteers will provide cleft care to patients encountering socioeconomic barriers to treatment. He will begin the mission on March 9, 2019 and will provide his expert medical treatments to all who need them. The Global Smile Foundation has provided treatments for cleft issues in underserved areas of the world for thirty-one years. Volunteer doctors and nurses have helped implement comprehensive cleft care in over twenty countries in South America, Africa, and the Middle East. Dr. Azizzadeh has chosen to work with the organization because he believes in its mission and has been a driving force in the development and advancement of facial plastic surgery. Dr. Azizzadeh earned his medical degree from the UCLA School of Medicine. He continued his studies with a residency in head and neck surgery at UCLA and a fellowship in facial plastic and reconstructive surgery at Harvard Medical School. Prior to opening his current practice, Dr. Azizzadeh served as a Clinical Instructor at Harvard Medical School, an Assistant Professor of Surgery at UCLA, and has served as the Co-Chairman of Cedars-Sinai’s annual Advances in Multispecialty Aesthetic and Reconstructive Surgery Symposium. In the past, Dr. Azizzadeh has served with The Global Smile Foundations on missions to underserved populations. His philanthropic efforts have allowed him and his practice to give back to the local community and the world at-large. Dr. Babak Azizzadeh, Chairman and Director of the CENTER for Advanced Facial Plastic Surgery, is one of the leading international experts in facial plastic surgery. His expertise in cosmetic and reconstructive facial plastic surgery has made him one of the most sought-after physicians. Dr. Azizzadeh's client list not only includes celebrities, executives, physicians and dignitaries from around the world, but also amazing people from all walks of life. He has been featured in Dr. Oz, The Oprah Winfrey Show, People Magazine, New York Times, Discovery Health, Los Angeles Times, Beverly Hills Courier and numerous other media outlets for his expertise in facial plastic surgery. Dr. Azizzadeh is one of a select group of surgeons who are double board-certified by the American Board of Facial Plastic and Reconstructive Surgery as well as the American Board of Otolaryngology-Head and Neck Surgery. His plastic surgery colleagues have consistently chose him as one of the Top Doctors in Beverly Hills, CA and Southern California. For more information, please visit https://www.facialplasticsbh.com/.